When you don't have much time to get supper on the table or you'd rather not turn on the oven, look to these quick and easy skillet dinners. Meals made on the stovetop can go far beyond your standard stir-fry, and cuisines can span the globe. Many of your favorites can be modified for the stovetop—no oven preheating required! Sliced potatoes and meaty flank steak make a hearty, comforting meal that's quick enough to enjoy on a busy weeknight. Oyster and soy sauce give this dish an umami note popular in many Asian cuisines. Buy frozen sliced potatoes to make it even easier, or slice and peel some fresh russets instead. Using chicken-flavor instant ramen as a base makes an easy Chinese-inspired meal come together in a snap. It's full of veggies and bursting with flavor. You can vary the vegetables or use thinly sliced pork instead of chicken for a different twist, too. Who doesn't love breakfast for dinner? Toss together this super quick and flavorful eggs and spinach dish when you're running low on ingredients and don't want to slave over dinner. Serve it with a fresh tomato salad, buttered toast, and a side of fresh fruit to round things out. This beefy, saucy skillet goulash tastes just like mom used to make. Gemelli, rotini, or other spiraled pasta stick to your ribs and hold the sauce nicely. Use any pasta shape you have on hand. Buying canned diced tomatoes with garlic saves an ingredient, but you can add minced fresh garlic if you prefer, too. With a bag of frozen mixed vegetables and ready-made stir fry sauce, you can have this five-ingredient stir fry ready before anyone can say "what's for dinner?" There is no need to thaw the veggies beforehand, but you'll want to break up any icy chunks to give them a chance to crisp. Cube or slice the beef in nice, regular portions so it cooks evenly too. This homey pork chop dinner comes together either in your crockpot or in a skillet on the stovetop, using converted or parboiled rice that won't get mushy during cooking. Either method works great; choose your favorite to suit the amount of time you've got on your hands or how much active time you'd like to spend putting it together. Use any kind of mushrooms you like for this zesty lemon chicken skillet that's easy enough for a family dinner but delicious enough to serve to guests. Button mushrooms are the most common, but you can use baby 'bellas or a mix of wild varieties. Just stay away from canned mushrooms because; they won't have the same texture. Enjoy all the meaty flavor of cabbage rolls with far less fuss by making this deconstructed version in your trusty skillet. Just shred the cabbage leaves and mix them right in with the beef, rice, and tomatoes. Use long-grain white rice for best results. The Paleo diet features recipes with lots of protein and this engine-revving skillet meal is no exception. Ground turkey, bacon, bell peppers, avocado, sweet potatoes, and eggs all blend together in a skillet for a filling meal that makes a great breakfast, brunch, or even dinner. To save time, chop the veggies the night before. 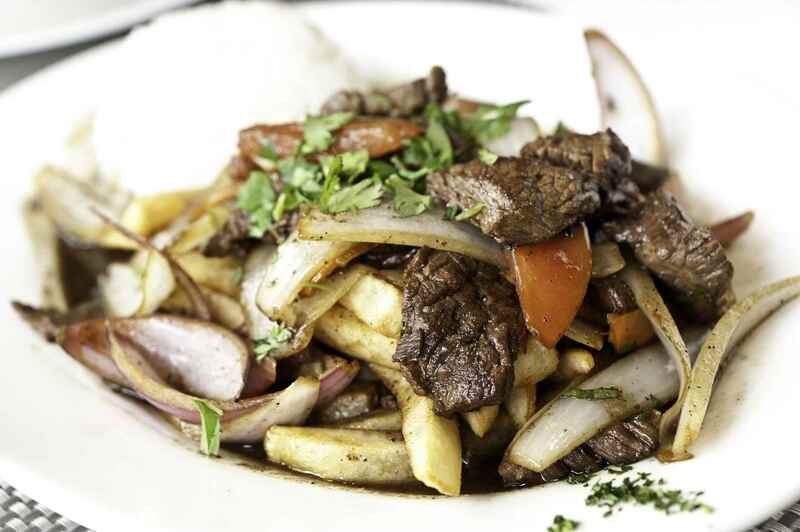 Sweet and sour dishes are popular for a reason: The tangy, tastebud-tingling combination keeps you coming back for more. Pineapple, ginger, and soy sauce create a succulent sauce for ground beef and veggies in this easy skillet you can serve over rice or potatoes, or by itself if you're watching your carbs. Try it with ground pork, chicken, or turkey too! Prepared Alfredo sauce makes this chicken with zucchini and tomatoes come together in a snap. Make homemade Alfredo or use another cheesy sauce if you prefer. Cajun seasoning gives it a little spice, but you can use cayenne pepper or another flavoring for a different twist. Ladle it over cooked pasta or toss it together with the noodles before serving. No need to bake this creamy macaroni and cheese—it's all cooked in a skillet on the stove! The diced green pepper gives the dish a nice hint of freshness that balances out the rich cheese perfectly. Chicken parmesan is traditionally baked until bubbly, but this simple recipe uses a skillet instead and takes about half an hour to make. Use either jarred or homemade tomato sauce and serve it over pasta with garlic bread for a classic, comforting Italian supper. When you hear the word "stew," you may think of a pot bubbling away on the stove all day. Let this skillet chicken, beans, and tomato stew change your mind! Bursting with Tex-Mex flavor, this stew can be made with leftover, shredded rotisserie chicken, or fully cooked chicken strips. Try serving with crusty bread or corn muffins for sopping up the last bits in the bowl. Swap your usual burger for one of these fried salmon patties to make a delicious lunch or dinner that's much easier than it looks. Use canned salmon for an easy preparation, or flake fresh fillets if you have them. Serve with a squeeze of lemon for brightness, and top with a little creamy tartar sauce. They're great on a bed of lettuce or sandwiched in a bun. This Spanish potato and egg frittata is usually sliced and served as part of a tapas spread in Spain, but it makes a lovely dinner by itself too. It's also super versatile; toss in any veggies or leftover meats you have in the fridge. If you have a nonstick skillet, you can flip it over to continue cooking the other side. If not, stick it under the broiler to finish. If you've got leftover pork, you're halfway to this hearty and delicious pork and potato hash. Condensed cream of mushroom soup gives it a rich creaminess, and peas and carrots round it all out. Any other creamy condensed soup works too, if you're not a fan of mushrooms. Serve it with warm biscuits to sop up the sauce. Midwesterners probably already know the wonders of tater tot hotdish. It's ubiquitous at potlucks, church suppers, and parties for its crunchy, creamy, salty, craveable flavor. It's made with mixed vegetables, condensed soup, and meat -- usually ground beef. And of course, it's topped with tater tots. Once you try this recipe, you'll want to add it to your regular rotation. Use either macaroni or penne pasta and ground beef to create this zesty, slightly spicy, tomato sauce-y meal. Plain diced tomatoes work well here, but you can pump up the flavor with chili-style tomatoes. Add a tablespoon of olive oil if you choose to omit the bacon, for the proper texture. Feta cheese, ground beef, and orzo pasta combine for a delicious and hearty Greek-inspired meal. Fresh rosemary has the most assertive flavor, but you can use dried in a pinch. You can also swap out the rosemary for basil, if you prefer. Other types of pasta work too, but little bite-size orzo is a nice change of pace. Get the kids in on the meal prep with this delicious and easy recipe that the whole family can help prepare. Don't turn up your nose at instant ramen noodles; they turn into a filling, flavorful meal when you add a protein, frozen vegetables, and eggs. Any kind of vegetable works well; choose the one your kids will eat without a fuss, or use this interactive recipe as a chance to coax them to try some new ones! Leftover roast beef can get challenging to use in an interesting, budget-friendly way. This cabbage and beef skillet results in a hash-like consistency that's both delicious and reasonably priced. Slice your roast beef nice and thin to get the right texture, or purchase thin beef slices from your butcher to create this tasty, satisfying supper. 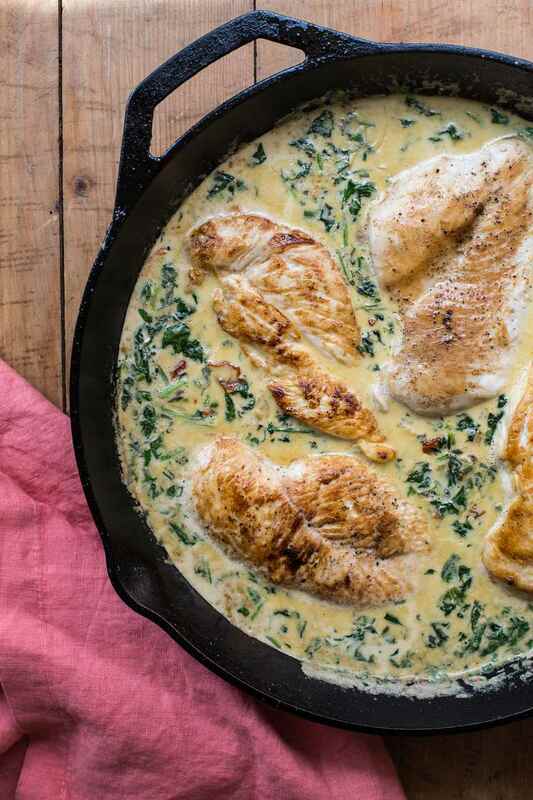 This creamy skillet chicken dish is both customizable and delicious. Swap out the spinach for another type of leafy green, use wild mushrooms or omit them altogether. Pump up the flavor by sprinkling in some rich Parmesan or fontina to the mozzarella, or add some sriracha or other hot sauce to give it a little kick. Serve with some crusty bread or pasta to soak up the sauce. You can't get much easier than this citrusy chicken and bell pepper stir fry. It only takes about 20 minutes and tastes great over hot white rice. For a successful, stress-free stir fry, cut and measure all of the components and bring them to the stove area with you. It cooks so quickly once you start, you will hardly be able to step away. Pork chops and apples are a match made in heaven. The fruit complements the meat, which has its own sweetness, too. Onion slices and a little dry mustard round it out. Use bone-in chops for extra flavor and Bosc pears for a change of pace, and feel free to add a little sliced fennel for a licorice-scented twist. Classic beef stroganoff with mushrooms usually gets baked, but this skillet version doesn't require the oven. It's creamy, hearty, and goes wonderfully over egg noddles or rice. Sprinkle chopped chives or parsley over the top before serving, for a pretty presentation. Shrimp and greens makes a healthy, satisfying dinner the whole family will love. Assertive, spicy hatch peppers add a nice kick to the dish. Use jalapeño or other hot peppers if you can't find that variety. Remember the heat comes from the ribs and seeds, so scrape those out to tame the spice. Creamy, tender scallops and crisp asparagus pair together perfectly in this simple and elegant recipe that comes together quickly enough for a weekday, but looks fancy enough for company. Pat the scallops dry before adding them to the pan, to get a nice crust. They cook quickly, so keep a close eye on them. Enjoy bacon and eggs in a whole new way with this easy, one-dish meal. It's hearty enough for breakfast-for-dinner and lends itself well to experimentation. Use different seasonings, trade bacon for sausage, or even tofu for a vegetarian version. Add chopped vegetables, or use hash browns instead of potatoes. You can make spaghetti and meatballs all in one pan with this simple recipe that makes use of pre-made ingredients. Frozen meatballs, jarred tomato sauce, and dried spaghetti noodles are blended with shredded mozzarella and parmesan for a homey meal you'll adore. If you prefer, feel free to use homemade meatballs or sauce, instead.